TORONTO, ONTARIO, September 18, 2018 -- Lupaka Gold Corp. ("Lupaka Gold" or the “Company") (TSX-V: LPK, FRA: LQP) is pleased to announce results from the ongoing systematic underground channel sampling program from the new development headings on the 3400 Level and 3430 sublevel, at the Company’s 100% owned Invicta Gold Development Project (“Invicta”). * Au-Eq. calculations are based on US$1250 for gold (“Au”), US$17.00 for silver (“Ag”), US$3.00 for copper (“Cu”), US$1.25 for zinc (“Zn”), and US$1.05 for lead (“Pb”), with assumed metallurgical recoveries of 85% for Au, 80% for Ag, 82 % for Cu and Pb, and 77% for Zn. 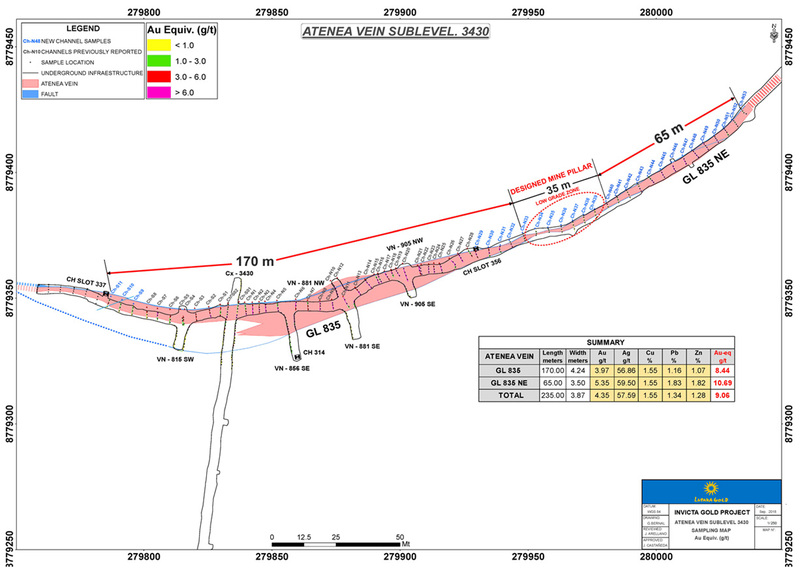 The Invicta underground exploration & development channel sampling program continues along the 3430 sublevel and 3400 Level (see plans - Appendix A & B) with the purpose of further defining the grade and horizontal limits of the Atenea vein.Drifts, 3.5 m wide by 3.5 m high, are being driven along the vein to the west and northeast, and channel samples are being systematically cut every 5 m along strike. On the 3430 sublevel, an additional 105 m of on-vein development has been completed to the west and northeast on the Atenea vein.The total development on-strike has been extended by 80% and now averages 9.06 grams per tonne g/t Au-Eq. over a strike length of 235 m, with an average sample width of 3.87 m.As anticipated, a low-grade mineralized zone was intersected, which is designed as a pillar in the mine plan, however the length of the low-grade section is only 35 m compared to an estimate of 44 m.Northeast of the planned low-grade pillar, the vein was extended a further 65 m along strike with channel sampling returning 10.69 g/t Au-Eq. over an average width of 3.50 m.While the vein extension was expected, the grades encountered were higher than estimated in the Mineral Resource Model.Drifting along the vein on the 3430 sublevel continues in both directions to the west and northeast, with additional cross-cuts being planned in order to confirm the true width of the mineralization. 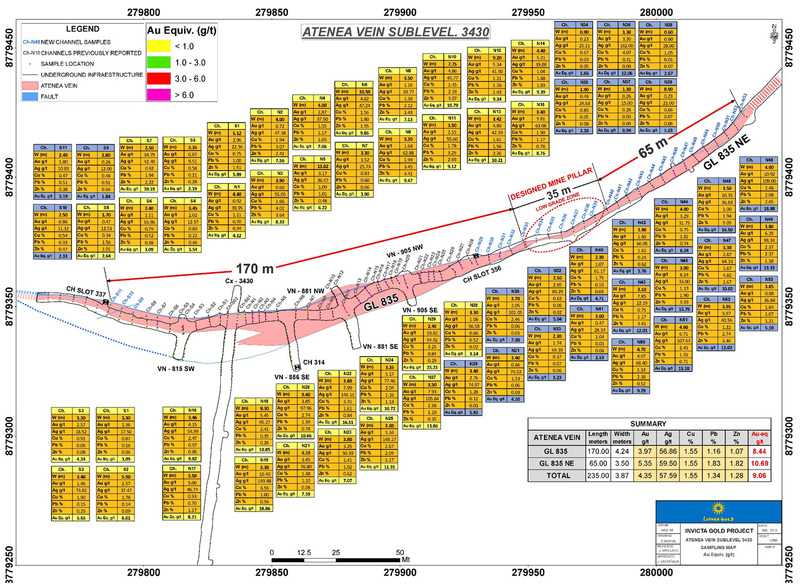 On the 3400 Level, development drifting has extended the footwall vein approximately 57 m to the west, while to the northeast an additional 33 m of development has been completed along the Atenea vein, ending in the low-grade pillar zone which extends upwards to the 3430 sublevel. Additional drift advancement is continuing in order to confirm continuity of the mineralization between the 3400 Level and the 3430 sublevel. The width of the Atenea vein has not been fully exposed and sampled on the development levels due to the constrained width of the development headings (3.5 m wide).Future development, including cross-cuts, slashing, and bazooka drilling, will be used to fully expose the true width of the vein on each development level. 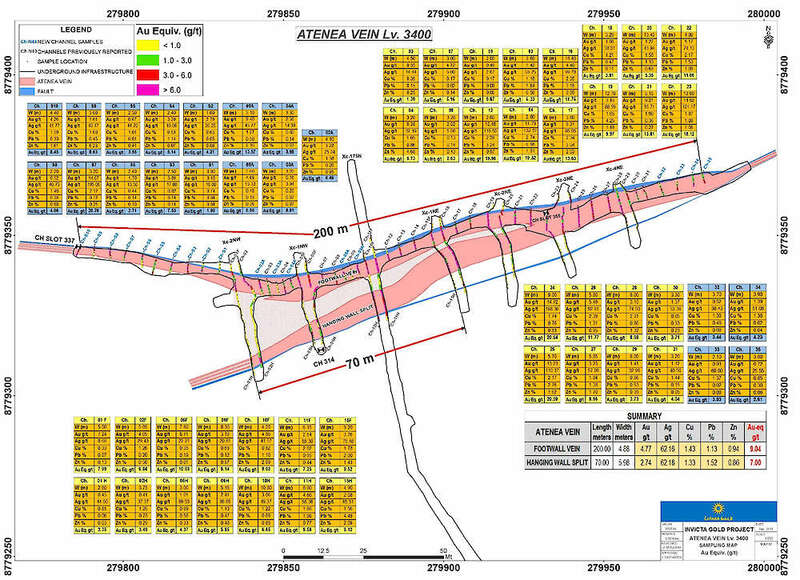 The polymetallic mineralization within the Atenea vein is hosted by structures which were mapped and sampled. Assay channel sample results for the 3430 sublevel are summarized in Table 1, and a detailed sampling map is provided in Appendix A.
Summarized channel sample assay results for the 3400 Level are presented in Table 2, and a detailed sampling map is provided in Appendix B. The analyses for the channel sampling campaign were carried out by ALS, an accredited laboratory, in Lima, Peru, exercising a thorough Quality Assurance and Control program (QA/QC). As part of QA/QC protocol, duplicates, standards and blanks were inserted into the sample processing stream. The sample locations were mapped, surveyed and photographed for reference. Individual sample channels vary between 0.2 to 2.5 meters wide.Samples were bagged, sealed and delivered to the ALS sample preparation facility in Lima, Peru. Gold was assayed by a 50-gram fire assay and re-assayed for the overlimits, with an AAS finish. All ALS labs are ISO 9000 registered. Lupaka Gold is an active Canadian-based company focused on creating shareholder value through discoveries and strategic development of its assets in some of the most prolific mining regions of Peru. Invicta Gold Development Project – Lupaka Gold’s 100% owned flagship project is an advanced stage gold-copper dominated, polymetallic underground project located approximately 120 kilometres north of Lima.Over $15 million of capital was spent by the previous owners on development and infrastructure at Invicta.Lupaka Gold’s management expects to commence production in the second half of 2018 using third-party mining contractors and utilizing the previous and ongoing vein development. The Invicta project is awaiting inspection for the final exploitation permit and has community agreements in place. 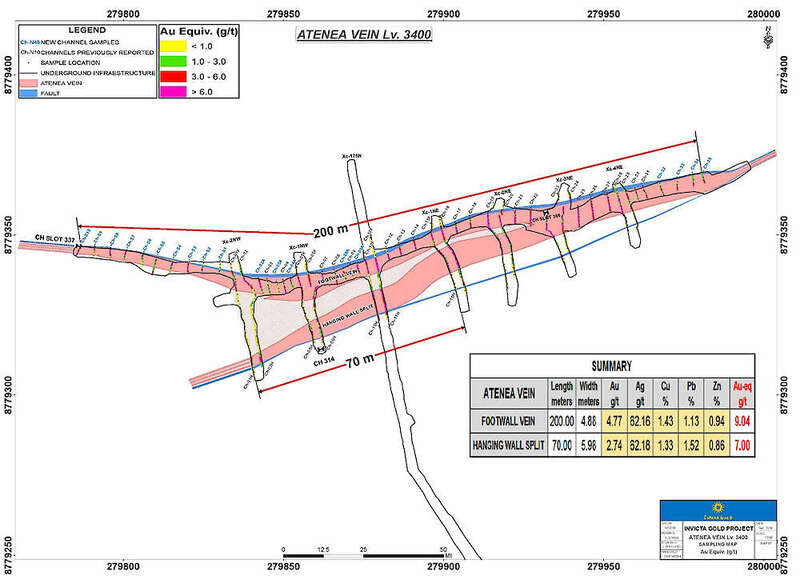 The underground operation of the Atenea vein will be focused initially on the extraction of about 80,000 tonnes (“t”) of Indicated Mineral Resources exposed on the 3400 Level and 3430 sublevel as well as the mining relief slot between the two levels, and the Inferred Mineral Resources within close proximity of the existing 3400 Level adit (up to 130 metres above the 3400 Level). Invicta’s approved EIA allows for mine production of up to 1,000 tpd, although the current conceptual mining plan is scheduling to commence at 350 tpd. The PEA is preliminary in nature and includes inferred mineral resources that are considered too speculative geologically to have economic considerations applied to them that would enable them to be categorized as mineral reserves.There is no certainty that the PEA results will be realized. Mineral resources that are not mineral reserves do not have demonstrated economic viability. The quantity and grade of reported inferred resources referred to in the PEA are uncertain in nature and there has been insufficient exploration to define these inferred resources as an indicated or measured mineral resource category. It is important to note while a mine production decision has been made by the Company, that the information provided in this news release is preliminary in nature. There is no certainty that a potential mine will be realized.The PEA is not a preliminary feasibility study or feasibility study.A mine production decision that is not based on a feasibility study demonstrating economic and technical viability does not provide adequate disclosure of the increased uncertainty and specific economic and technical risks of failure associated with such a production decision. This press release contains forward-looking statements which constitute "forward-looking information" within the meaning of applicable securities laws, including all statements, trend analysis and other information relative to anticipated future events or results. All statements, other than statements of historical fact, included herein are considered forward-looking statements, including, without limitation, statements relating to: the continued development of the 3400 Level and 3430 Sublevel, additional sampling and the anticipated timing and results thereof; and an updated resource estimate for the Invicta Gold Development Project and the timing and results thereof. Forward-looking statements are based on assumptions, estimates and opinions of management at the date the statements are made and which the Company believes are reasonable. Such information involves risks and uncertainties, and undue reliance should not be placed on such information, as unknown or unpredictable factors could have material adverse effects on future results, performance or achievements of the Company. Among the key factors that could cause actual results to differ materially from those projected in the forward-looking information are the following: that the repayment of the PLI Financing is consummated on the anticipated terms; that the Company will not experience any material accident, labour dispute, shortage of skilled and professional staff, changes in project plans, equipment availability and failures, process failures, the ability of third party service providers to deliver services on reasonable terms and in a timely manner;future exploration activities planned at the Invicta Gold Project, and the timing and results thereof; market conditions and general business, economic, competitive, political and social conditions and with respect to the planned mining operations at Invicta; that pre-production mine development can be completed in the time and for the cost projected; that the Company will be able to obtain funding for planned production expenses; that mineralization at Invicta will be of the grades and in the locations expected; that the Company will be able to extract and transport mineralized rock efficiently and sell the mineralized rock at the prices and in the manner recoveries and quantities expected; that permits will be received on the terms and timeline expected and that other regulatory or permitting issues will not arise; that mining methods and reclamation can be employed in the manner and at the costs expected and that such methods yield the results the Company expects them to. Forward-looking information involves known and unknown risks, uncertainties and other factors which may cause the actual results, performance or achievements of the Company to be materially different from any future results, performance or achievements expressed or implied by the forward-looking information.Such risks, uncertainties and other factors include, among others: all of the risks described in this news release; that the Company will not be able to comply with the delivery or other obligations in the PLI Financing Agreement and the risk that PLI will enforce its security over the Company’s assets, including its mineral properties; s; changes in commodity prices; currency exchange rates (such as the Canadian dollar versus the United States dollar); risks associated with dilution; labour and employment matters; risks in the event of a potential conflict of interest; changes in general economic, business and political conditions, including changes in the financial markets; changes in applicable laws; and compliance with extensive government regulation; and other risks generally associated with mineral exploration. This forward-looking information may be affected by risks and uncertainties in the regular course of business and due to market conditions. Additional risks are described in the Company’s annual information form, which is available on SEDAR at www.sedar.com.